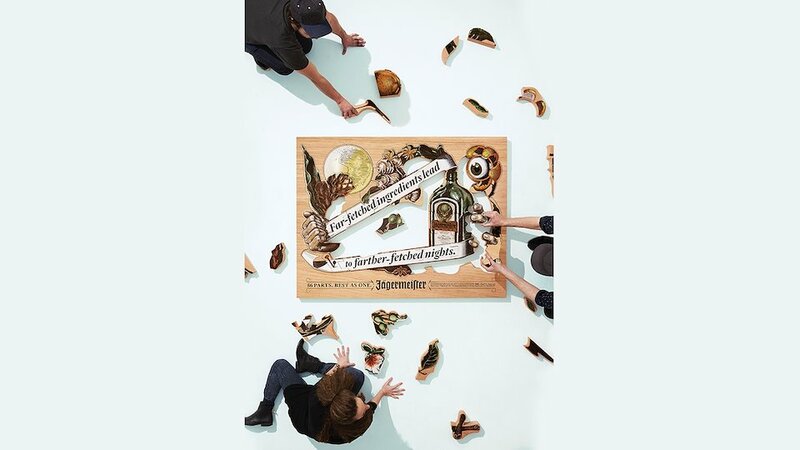 Jägermeister is made of exactly 56 ingredients, aged in oak barrels. So we made executions made of 56 wooden parts. 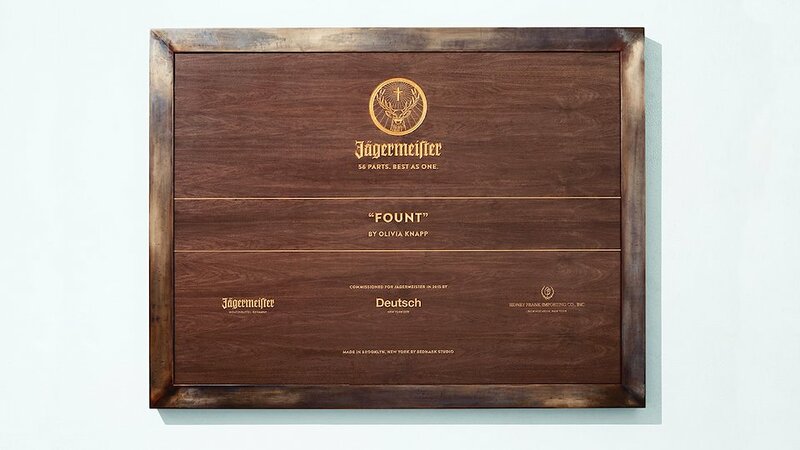 “Fount” by Olivia Knapp. 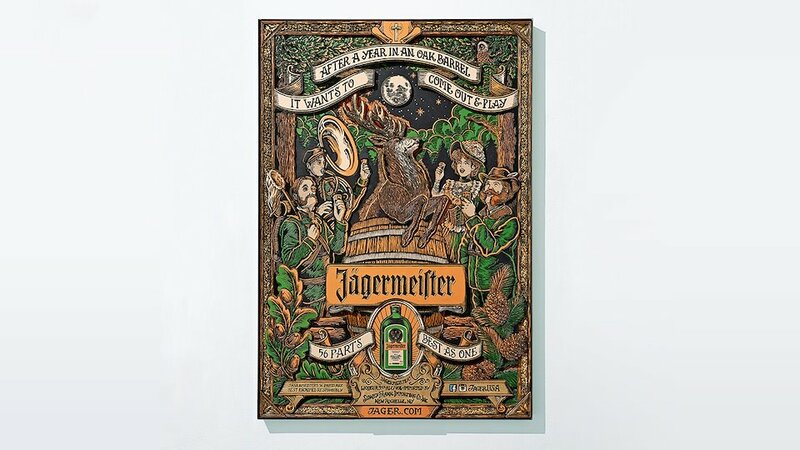 To highlight the exotic ingredients in Jägermeister, we partnered with Olivia Knapp, a Seattle-based illustrator who specializes in combining modern subjects with a centuries-old cross hatching technique. 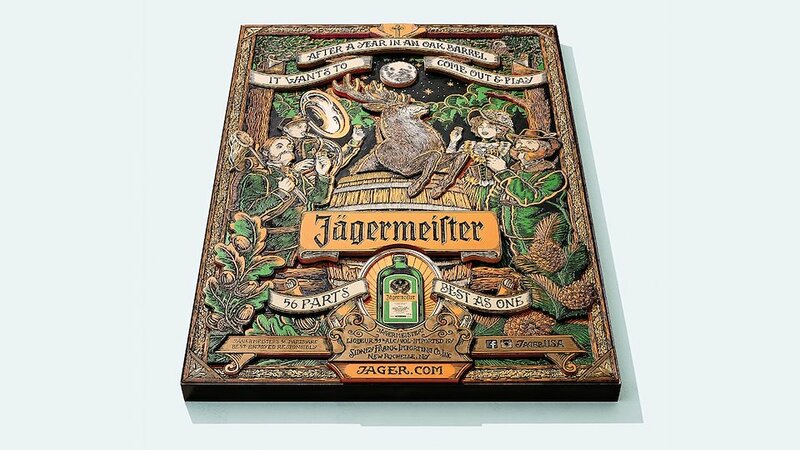 The result is completely original and unorthodox, just like Jägermeister’s combination of 56 ingredients sourced from around the world. All 56 parts of “Fount” by Olivia Knapp. The final artwork is 60" x 46", framed in black steel and weighs 350 lbs. Assembly of “Fount” by Olivia Knapp. The final artwork is 60" x 46", framed in black steel and weighs 350 lbs. “Fount” by Olivia Knapp. The final artwork is 60" x 46", framed in black steel and weighs 350 lbs. Back of “Fount” by Olivia Knapp. “Cheers” by Yeaaah Studio. 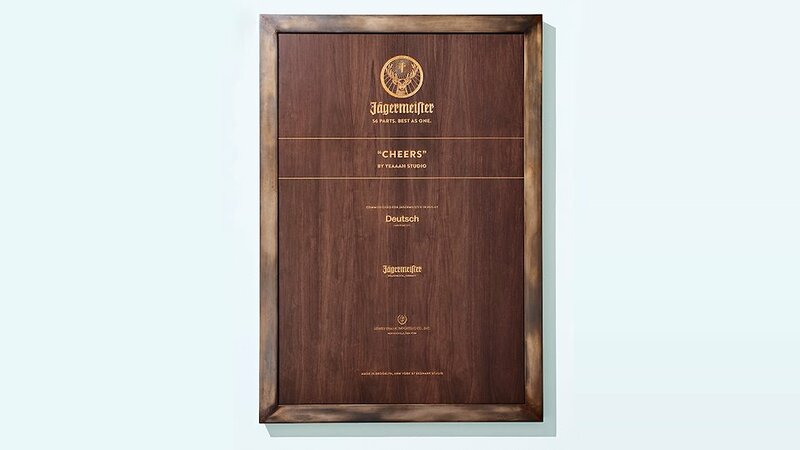 Jägermeister’s heritage is all about the stag, the forest, the link to master hunters or "Jägermeisters," the year it spends aging in oak barrels, and the random people you meet on a night out. Paris-based Yeaaah! Studio was able to bring all that to life—and more. All 56 parts of “Cheers" by Yeaaah! Studio. The final artwork is 48" x 70", framed in black steel and weighs 375 lbs. 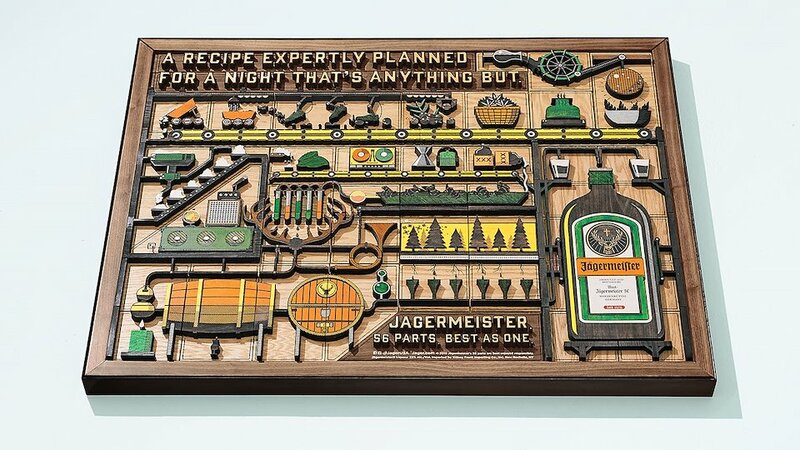 Assembly of “Cheers" by Yeaaah! Studio. The final artwork is 48" x 70", framed in black steel and weighs 375 lbs. Back of “Cheers" by Yeaaah! Studio. “The Process” by DKNG Studios. 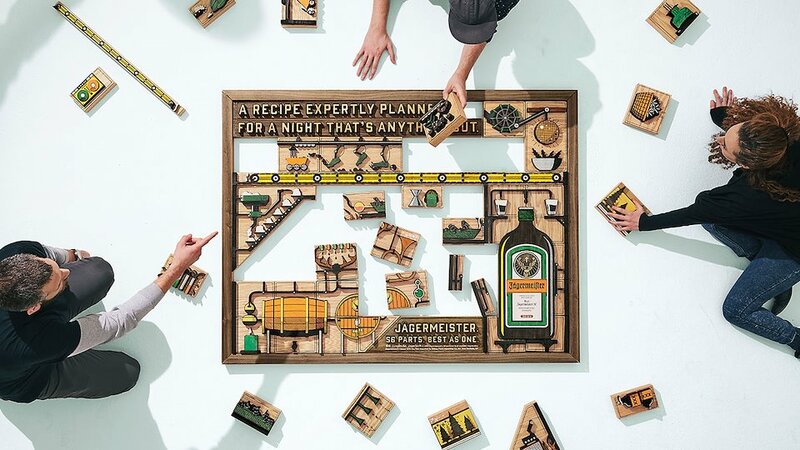 To capture the crazily-crafted process of making Jägermeister, LA-based DKNG crafted something just as crazy. “The Process” is a wild homage to the weighing, milling, grinding, blending and all the other secret steps that bring the 56 parts together. 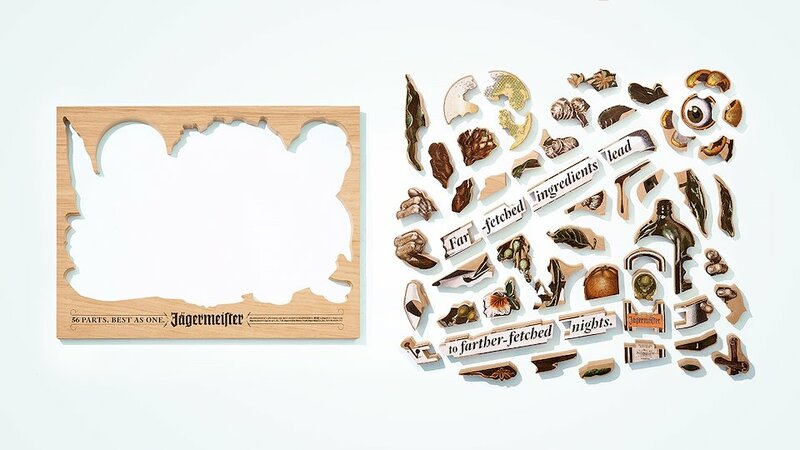 All 56 parts of “The Process” by DKNG. The final artwork is 60" x 46", framed in black steel and weighs 350 lbs. 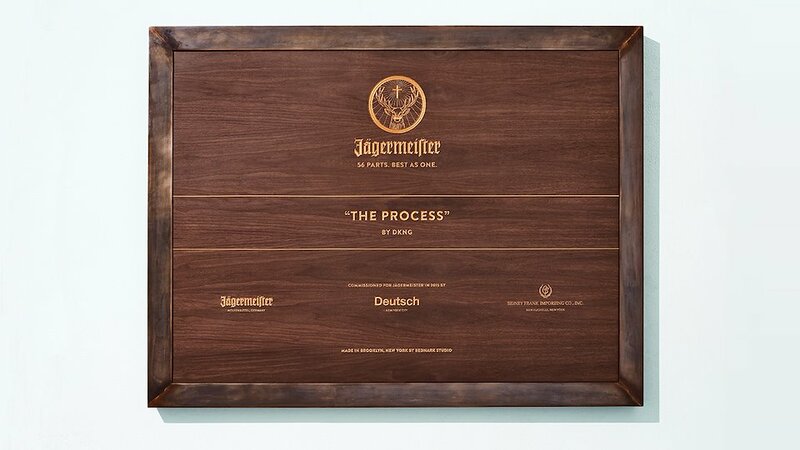 Assembly of “The Process” by DKNG. The final artwork is 60" x 46", framed in black steel and weighs 350 lbs. “The Process” by DKNG. The final artwork is 60" x 46", framed in black steel and weighs 350 lbs. Back of “The Process” by DKNG. In the week before launch, we teased out the campaign with these 6 short social media videos. All shot as physical stop motion and all posted on Instagram, Facebook and Twitter. 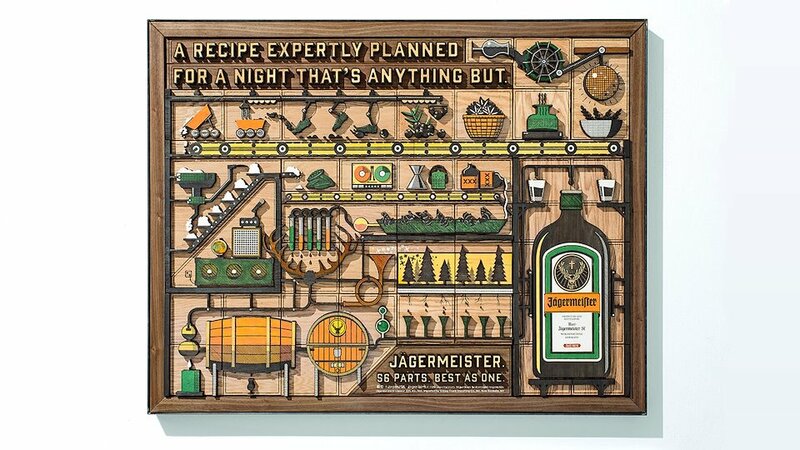 People think they know all about Jägermeister. 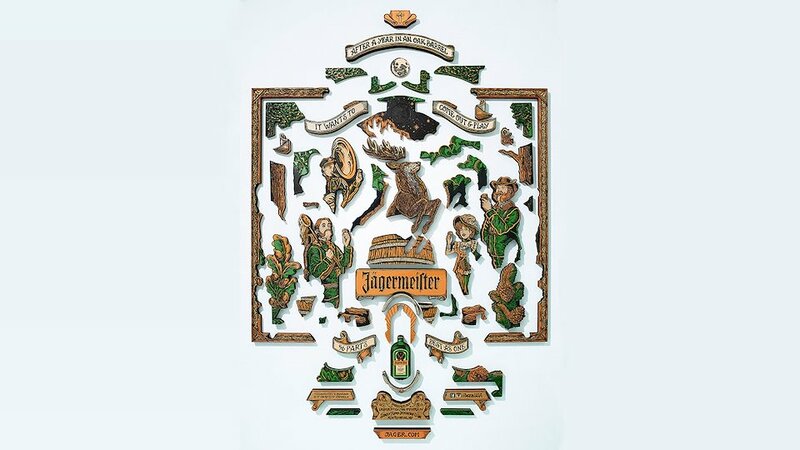 Nobody knows that Jägermeister is made from 56 harmoniously balanced roots, fruits, herbs and spices. 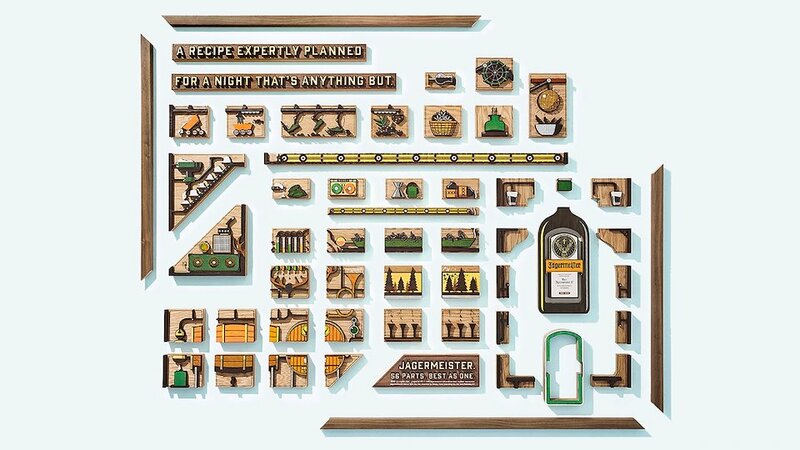 Nobody knows that it’s one of the most well-crafted drinks on the planet. 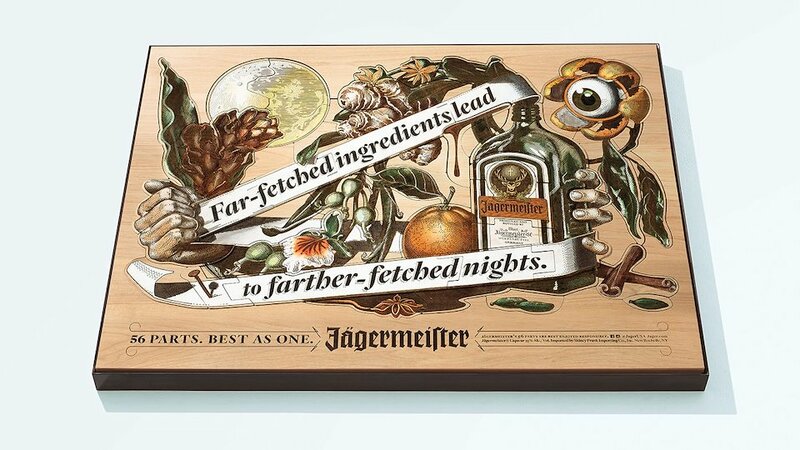 So to tell that story, Jäger and Deutsch teamed up with illustrators Olivia Knapp, Yeaaah! Studio and DKNG. 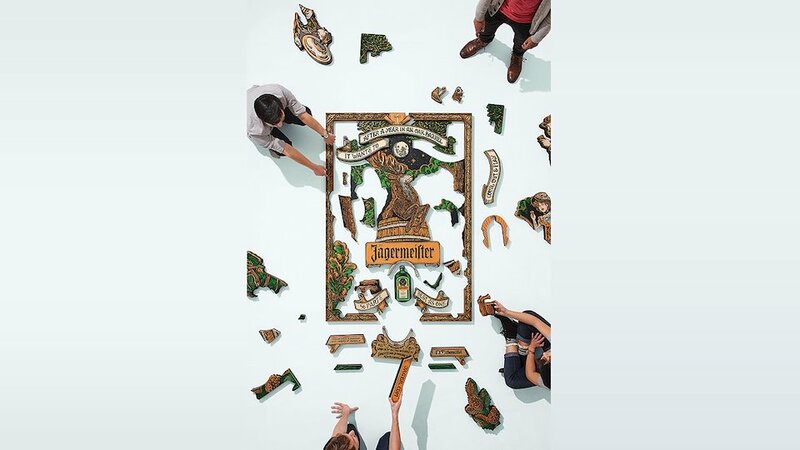 The goal: create three amazing works-of-art—each made from exactly 56 separate pieces of wood puzzled together. 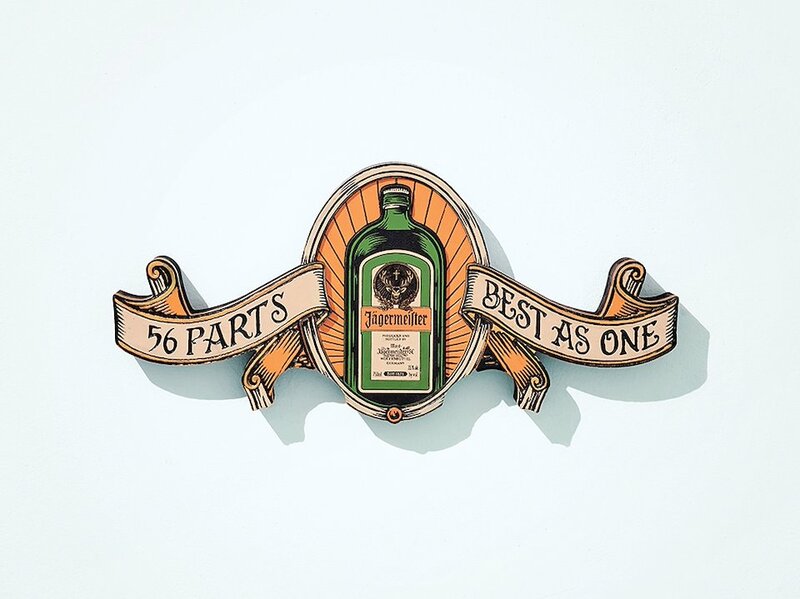 Like the shot, they are “56 Parts. 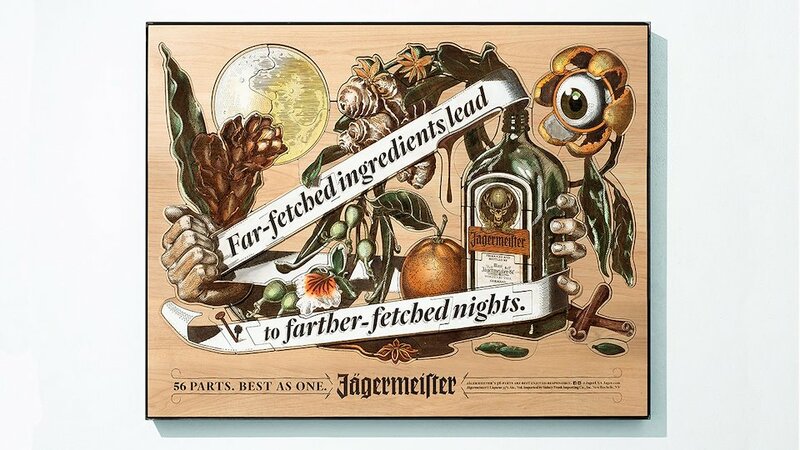 Best as One.” The result: A campaign that’s as well-crafted as the stuff inside the bottle.